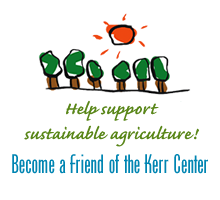 The Kerr Center works with other organizations to promote education on topics related to sustainable agriculture. I am currently working with a new organization in Oklahoma, the Oklahoma Monarch and Pollinator Collaborative. Their main initiative is the Okies for Monarchs project. Visit the website and see what is being done in Oklahoma to protect and enhance monarch butterfly habitat.